This entry was posted in Uncategorized on February 28, 2014 by Gary. 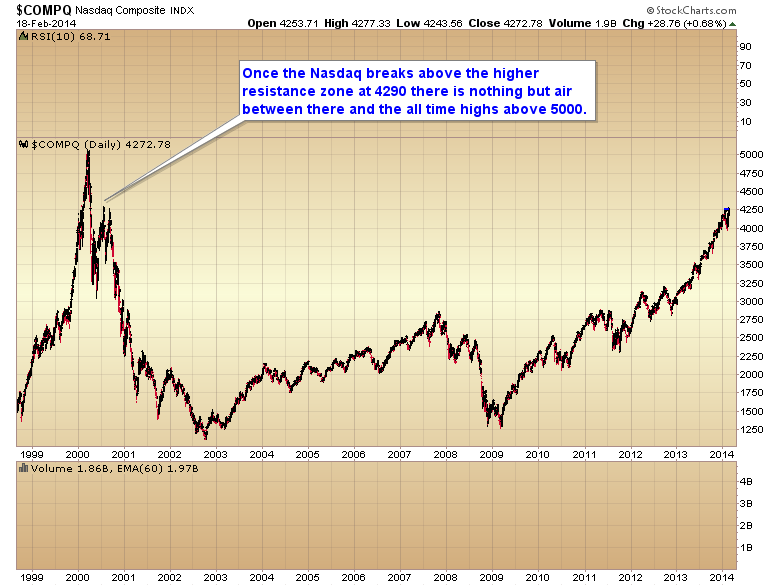 The Nasdaq has now broken out above the first of two major resistance zones at 4250. Once it breaks above 4290 there is nothing but air between there and the all time highs above 5000. The SMT commodity portfolio is leaping higher as coffee surged 9% today and the grains and softs are just starting to join the party. Actually all of the SMT portfolios are racking up nice gains so far this year (currency portfolio, stock portfolio, commodity portfolio, metals portfolio and bond portfolio). I realize most people see this as a gold bug site but I actually think the biggest gains this year will be made in the AG sector. I think we are in store for another 2010/2011 type year and the frustration of having to endure 2013 will turn out to be well worth the wait. This entry was posted in Uncategorized on February 19, 2014 by Gary. Today another piece fell into place in my Grand Inflation scenario that I’m expecting for 2014. Before I begin let me recap. My overarching driver for the Grand Inflation scenario is that the dollar would have some kind of crisis, or semi-crisis late this year as it drops down into its major three year cycle low. All other stock and commodity movements will be driven by this impending currency crisis. For stocks, I’m expecting a final bubble phase parabolic spike over the next 4-5 months, followed by a devastating crash as the parabola collapses in June or July. For commodities I’m expecting a stealth rally for another month-month and a half, followed by a super spike inflationary phase in the latter half of the year as the dollar collapse reaches maximum intensity. 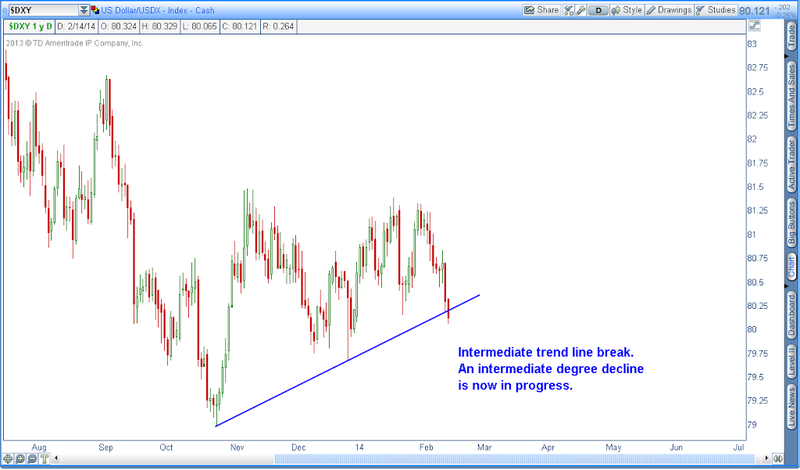 Today the dollar broke through its intermediate trend line confirming that an intermediate degree decline is now in progress. Since this intermediate cycle topped on week two in a left translated manner, the odds are very high that the dollar is going to break below the October low before this intermediate cycle bottoms. I’m actually expecting another test of the megaphone topping pattern trend line before this intermediate cycle bottoms sometime in March or early April. The real damage is yet to come later in the year though. The next component is the stock market. The movement in stocks over the next 4-5 months is a very important component for the Grand Inflation to unfold. 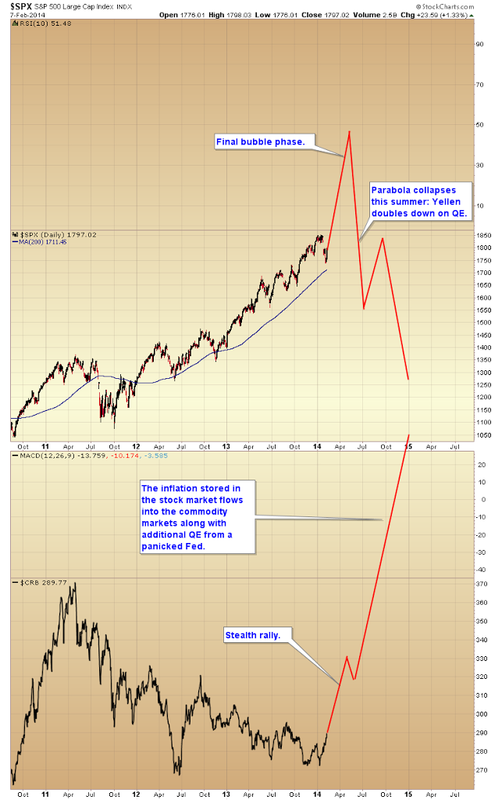 Stocks must enter a final parabolic, melt up, bubble phase during the first half of this year. The very mild intermediate cycle low that bottomed last week has set the stage for this scenario to begin. In only five days the NASDAQ 100 has already moved back to new highs. This confirms my expectation that we are going to see the NASDAQ test the all-time highs above 5000 before this cyclical bull market comes to an end. At that point the parabolic advance in the stock market will experience its initial collapse, and I expect the S&P will crash at least back to the 2000/2007 support zone at 1550. This is another critical component for the Grand Inflation to unfold as it will cause Yellen to panic, reverse the taper, and probably initiate QE5 & 6. This won’t reflate the broken parabola but it will trigger a reaction rally before the collapse continues into a massive bear market that will bottom below 666 sometime in early to mid 2016. 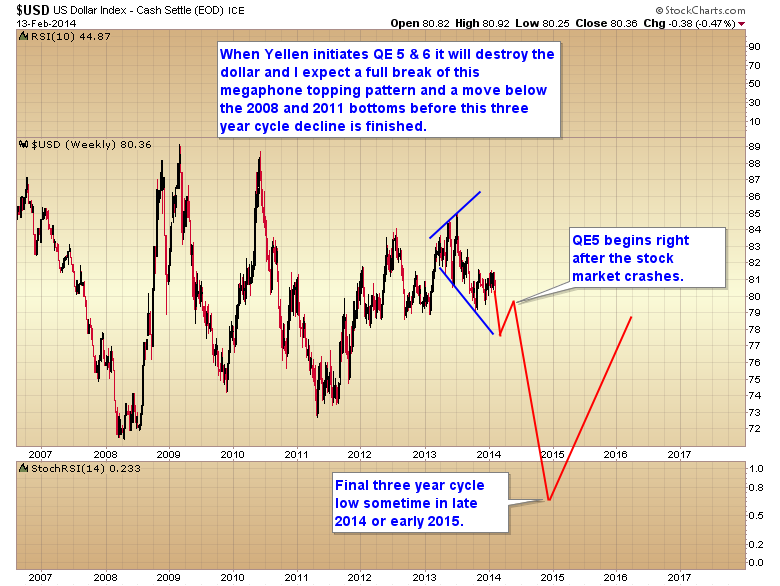 QE 5 & 6 will be the final nail in the coffin for the dollar, and will trigger a full break of the megaphone top. I expect a move below the 2011 and 2008 bottoms before the dollar completes its final three year cycle low. Commodity markets have already begun the stealth rally that I was looking for during the first half of this year. 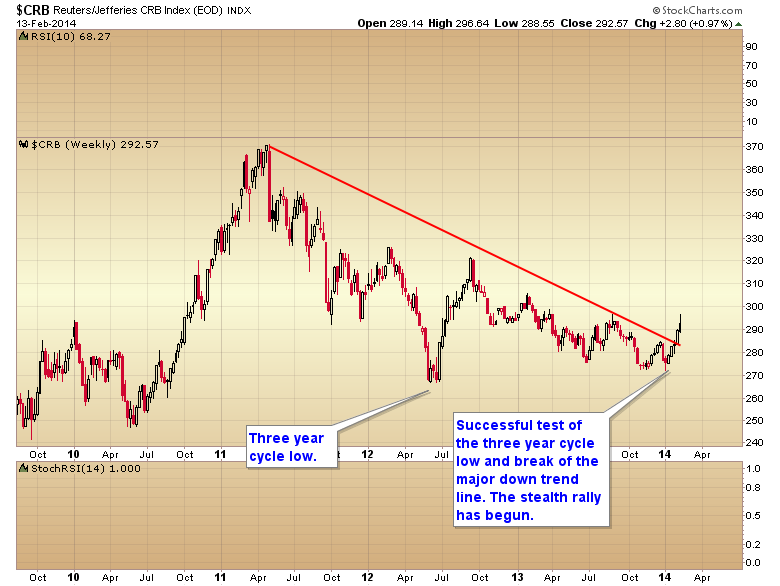 They successfully tested the 2012 three year cycle low and have now broken through the multiyear downtrend line. The Grand Inflation has begun. 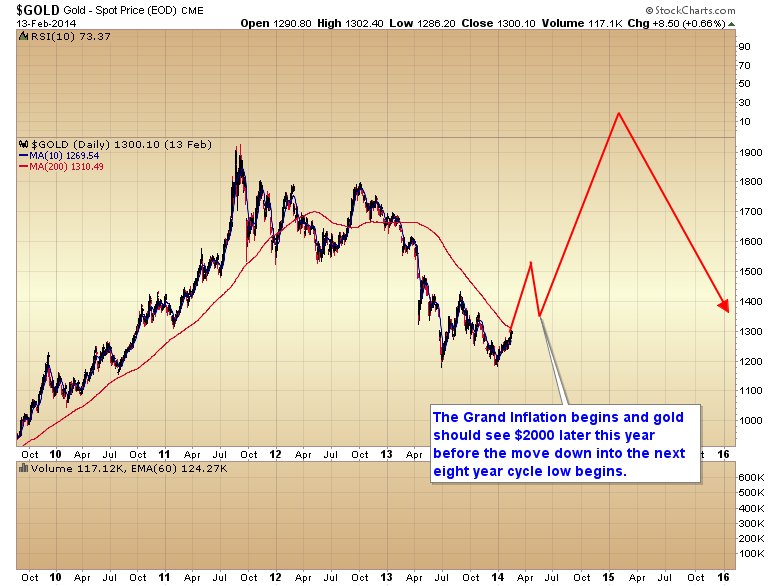 During this stealth rally I’m expecting gold to test the initial April breakdown at 1520 over the next 1-2 months. That should push sentiment levels to bullish extremes from their current depressed levels, triggering an intermediate degree profit taking event into May or June as the stock market finishes its final parabolic blowoff top. As you can see silver sentiment is already recovering nicely and today’s move will likely push sentiment to levels next week requiring the metals to pullback and take a breather. 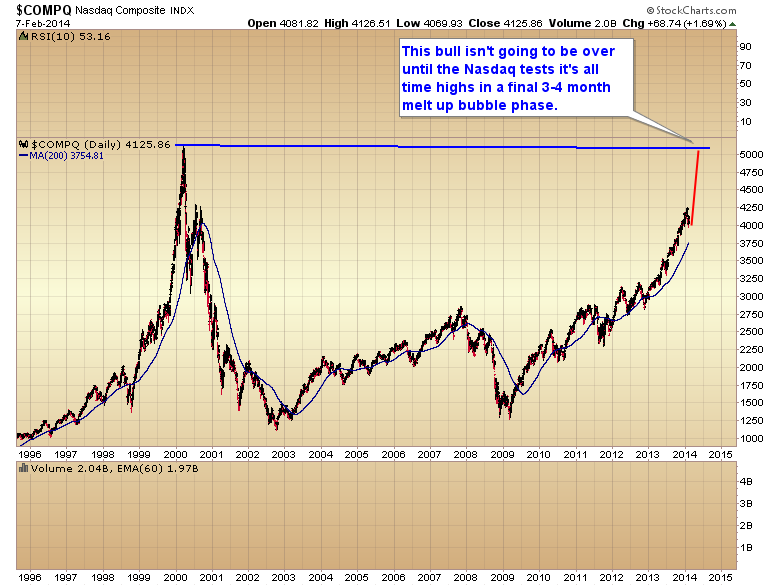 Over the next 4-5 months the easy money is going to be playing the final bubble phase in the stock market. Bubble tops don’t come around very often, but when they do traders can make an obscene amount of money in a short period of time. Once the stock market bubble pops, and Yellen starts QE5 that’s the point at which the Grand Inflation will begin in earnest, and I believe gold will probably rocket from an intermediate bottom of around 1350-1400 this summer, to test $2000 by the end of the year. This is the phase where the metals become the “easy trade”. Over the next couple of months everything should generally rise together. 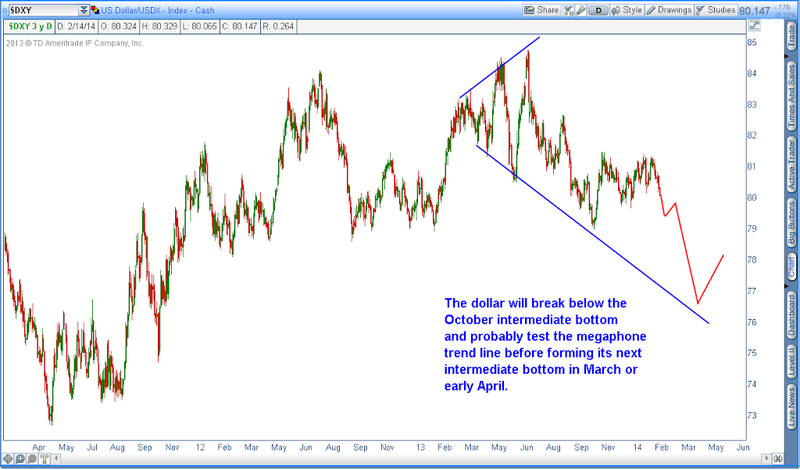 But once the dollar puts in an intermediate bottom sometime in March or April, commodities and gold will move down into and intermediate correction as the stock market completes its final blowoff top. 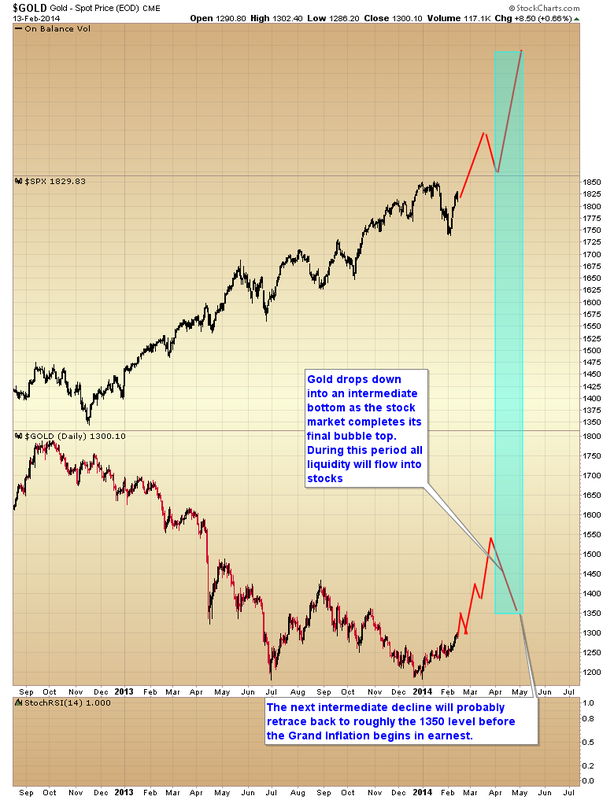 After the stock market parabola collapses later this summer it will be time to put the pedal to the metal in the commodity markets, and especially the precious metal markets as the Grande Inflation begins in earnest. This entry was posted in Uncategorized on February 14, 2014 by Gary. For over a year now I’ve been expecting 2014 to be the year when the unintended consequences of five years of QE come home to roost. By the end of the year we are going to have a massive inflationary spike in commodity prices that will collapse the global economy. It’s all going to start with a final manic melt up phase in the stock market over the next 3-4 months. 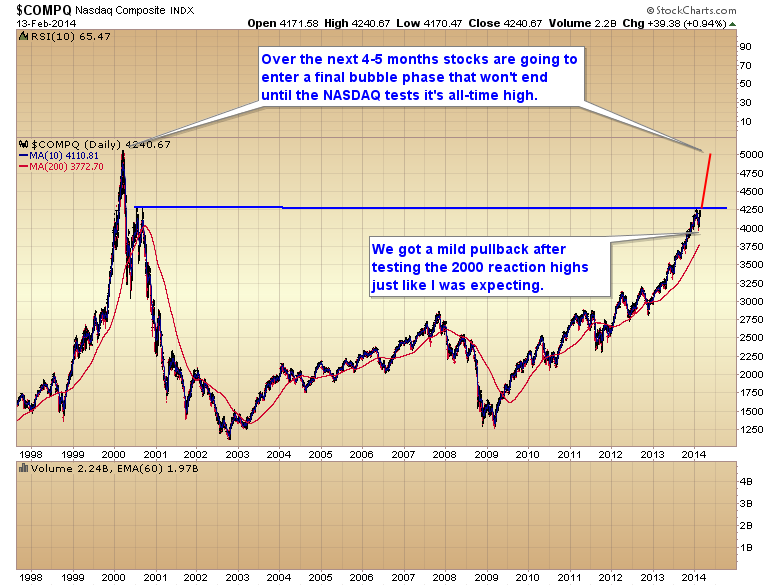 Make no mistake, this bull market will not be over until the NASDAQ tests it’s all time high above 5000. Over the next 3-4 months we are going to see the public pile into the stock market exactly like they did with tech stocks in 2000, and real estate in 2005. Completing the final bubble phase in the stock market is the first component necessary for the Great Inflation. During this period commodities are going to start to rise in a stealth rally that everyone will ignore because they will be focused on the stock market. 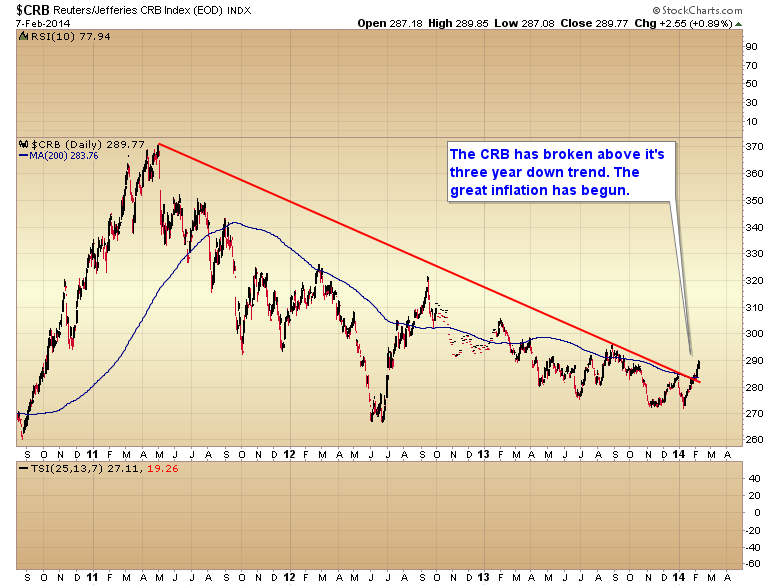 The CRB has already broken out of its three-year downtrend. 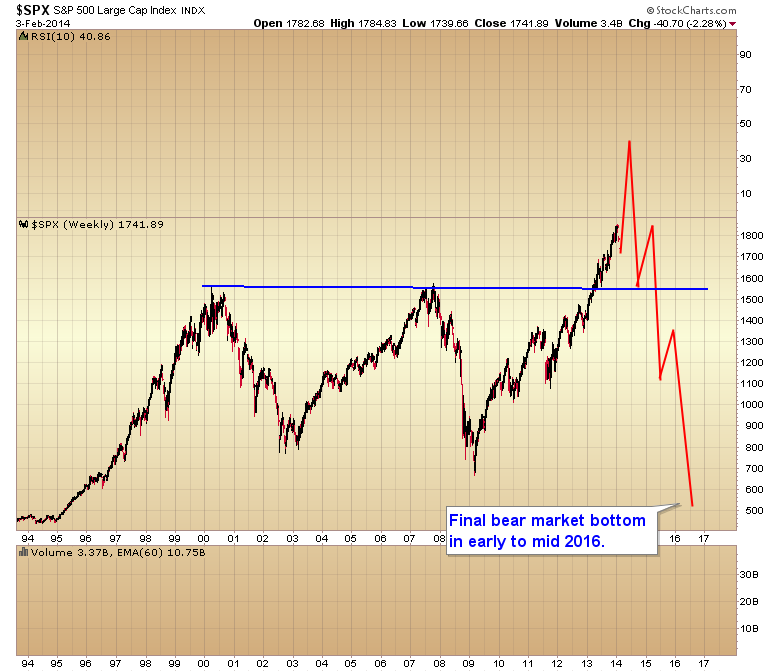 At some point later this year, probably in May or early June the stock market parabola will collapse. This is the second component necessary to initiate the Great Inflation. 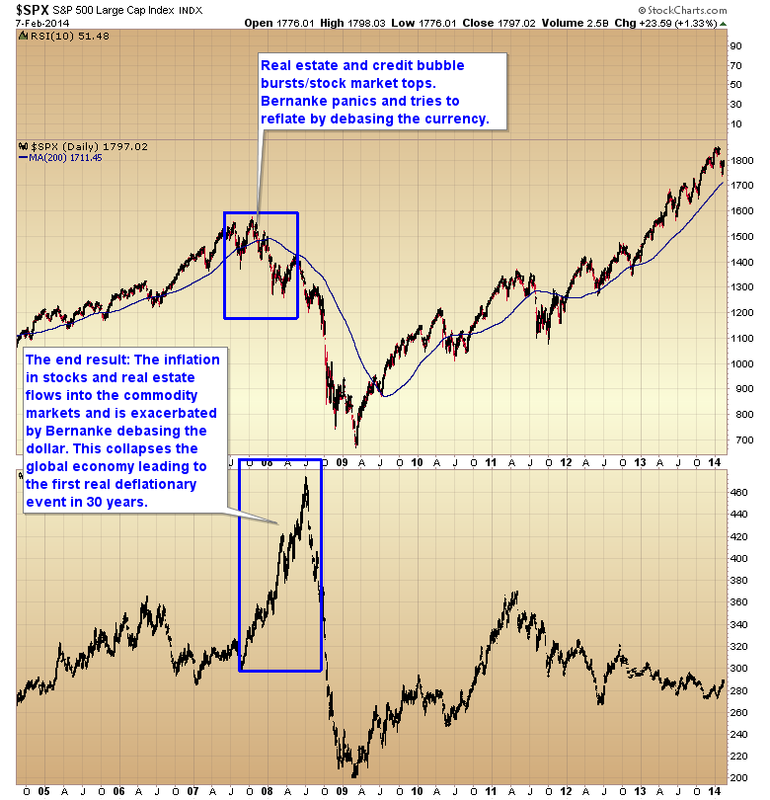 When the crash begins the inflation stored in stocks will flow into the commodity markets. This process will be exacerbated as Yellen reverses the taper and doubles down on QE to try and reflate the stock market bubble. This will be like throwing gasoline on a fire, and will drive commodity prices through the roof into the end of the year and probably the spring of 2015. The Fed is going to make the exact same mistake they did during the last decade. Their easy monetary policy has produced a bubble in stocks just like it produced a bubble in real estate in 2005. When the bubble implodes the Fed will try to reflate. 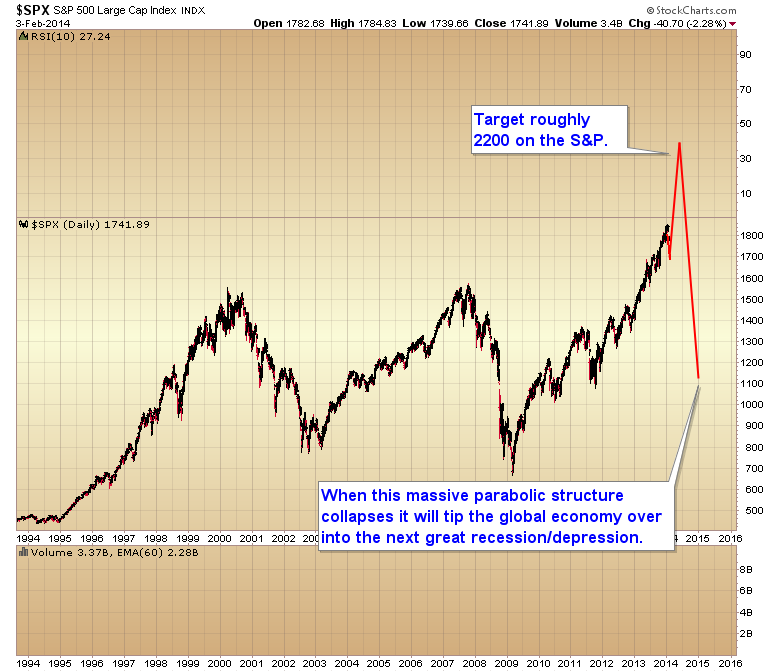 They won’t succeed in reflating the broken stock market parabola, but it will trigger an explosion in commodity prices. The rapid spike in commodity prices will collapse the global economy just like it did in 2008. 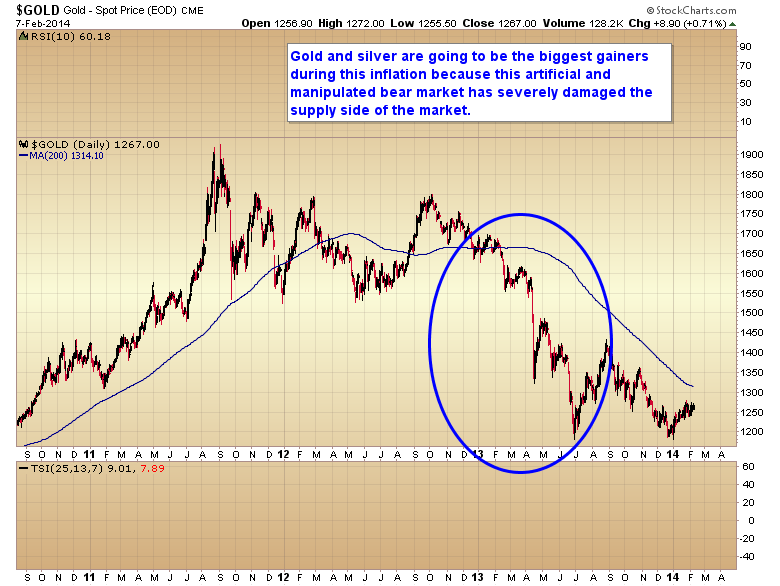 Because the artificial and manipulated bear market of the last year has severely damaged the supply side of the market, I expect the precious metals will be the largest beneficiary during the Great Inflation of 2014. By this time next year all of the Chinese/Russians/Indians, etc. who have been scooping up gold over the last year are going to look like geniuses. This entry was posted in Uncategorized on February 8, 2014 by Gary. Contrary to what Monkey boy was calling for we made a decent profit on our put position and entered at almost the exact bottom of the stock market correction. I also lifted my hedges today on all metal positions. I think it’s time for gold and stocks to rise together again, which has been the norm for most of the secular bull market. 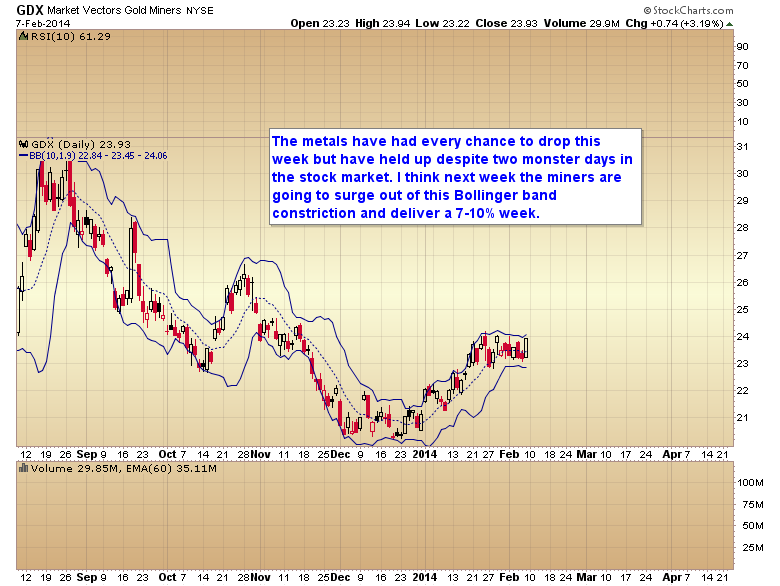 I think miners are going to break out of the Bollinger band constriction and deliver a 7-10% gain next week. And that’s just the beginning. My prediction for 2014: The SMT is going to have another 100% + year this year. It’s been my opinion now for a the last year that the bull market that started in March of 2009 at 666 on the S&P would come to an end either in late 2013, or early 2014. I’m confident that will be the case, but based on the cyclical pattern of the current decline I believe we still have one last leg up before this bull comes to an end. I think the intermediate decline now in progress is going to create the conditions for a final manic melt up phase over the next 2-3 months to complete this huge parabolic structure that the Fed has constructed with 5 years of QE and 0% interest rates. We’ve come this far and tested the 2000 reaction high, I have to think we’re probably going to go all the way and test the all-time highs on the NASDAQ before this bull market comes to an end. A similar percentage advance would place the S&P 500 at roughly 2200 points which when completed would represent a massive parabolic structure that when it collapses will tip the globe over into the next recession/depression. So when do we buy stocks you ask? Should we buy today? The answer is, no I don’t think the intermediate decline is done just yet. 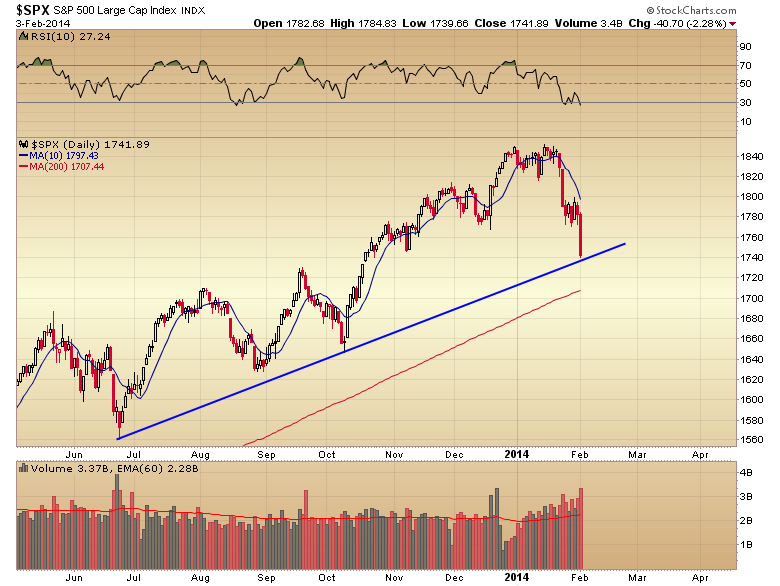 We first need to break the intermediate trend line to confirm this as an intermediate degree correction. 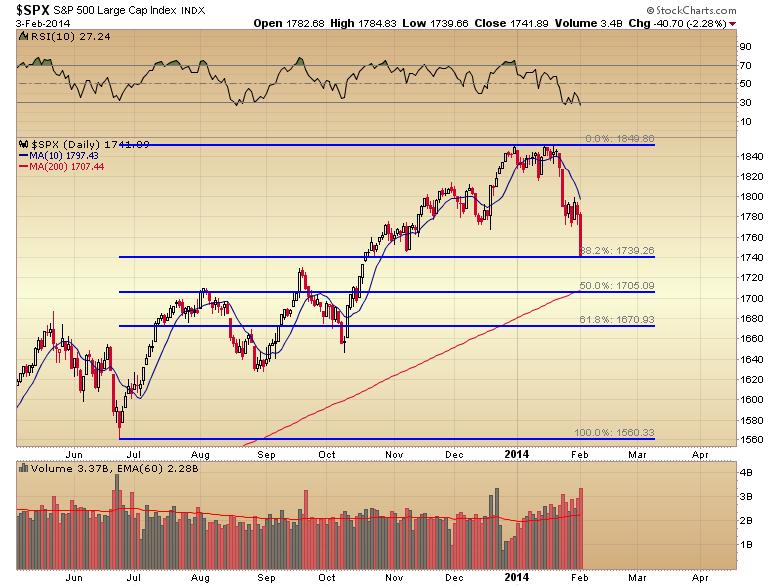 At the very least I think the S&P needs to retrace 50% of its recent intermediate rally. That comes in at roughly 1700-1705. On a cyclical basis the current daily cycle is on day 31. 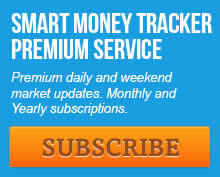 The average duration from trough to trough for a daily stock market cycle is 35-40 days. So it’s still just a little bit early for this cycle to bottom. There are two events coming over the next week and a half and I’m pretty sure one of them is going to serve as the trigger for this daily and intermediate cycle to bottom, and the melt up phase of this bull market to begin. The first is the employment report Friday morning. The second is Janet Yellen’s Humphrey Hawkins address next Tuesday. Before or during one of these two events I think stocks will make a final plunge to test that 50% retracement/200 day moving average. That’s the point where retail investors will panic and professional traders will be loading up the boat for the final run of this bull market. The one caveat is, if the stock market were to crash 150-200 points over the next 5-6 days then it would signal the parabolic structure is already in collapse and the top of this bull market occurred earlier this month. I don’t really think this is going to be the case as the current intermediate rally lasted 30 weeks. That’s not how a final intermediate degree move should behave. When we do get a final top I expect it will come around week 10-12 of the then current intermediate cycle. An intermediate cycle that tops on week 30 just doesn’t have enough time to complete an initial bear market move. So what I’m looking for once we complete this bottom sometime in the next 4-6 days will be a 2-3 month rally that will top sometime in late March to mid April. That would give us a final intermediate top somewhere around that 10-12 week period. 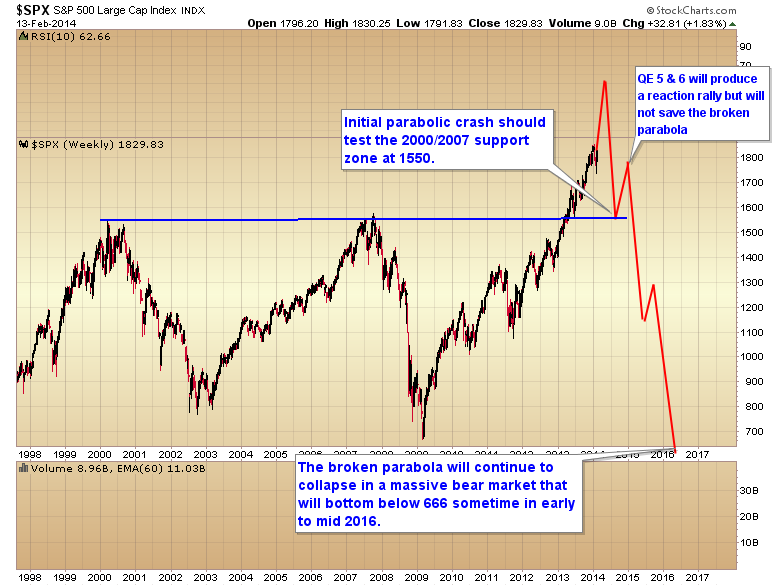 At that point we should get an 8-10 week crash as the parabolic structure collapses. 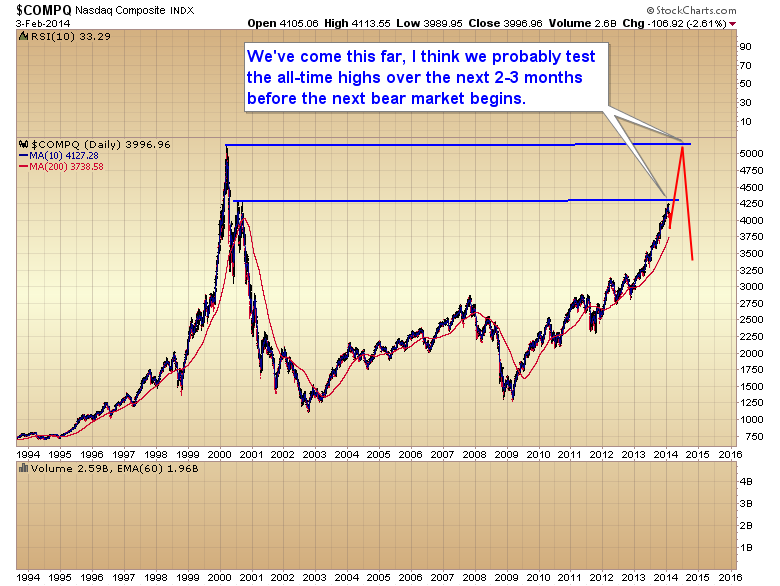 The initial target would be the 2000/2007 all-time highs followed by a final bear market bottom in early to mid 2016. Over the next week and a half I will be watching for certain timing signals to try and determine whether the bottom is going to come on Friday’s employment report, or on the Humphrey Hawkins address next Tuesday. Either way, we should be on the verge of entering another bubble phase very similar to 1999. Again with the caveat that we not see a 150-200 point crash over the next 4-6 days. This entry was posted in Uncategorized on February 4, 2014 by Gary.